Picking out a shirt, picking out a shirt, picking out a shirt… This should be a really easy thing to do. 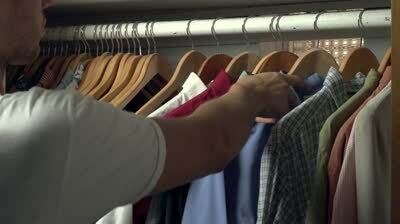 Go to the closet, find a clean shirt, pick that shirt out to wear. Ah, but it’s never that simple. See, the forecast may be calling for cloudy skies the next day, so you don’t want to pick out something really bright. You might run into someone important or someone you haven’t seen in a while, so you want to look fairly decent, but you also want to be fairly casual. Then you have to get the right jeans – dark or light? Ooh, but then you have to figure in the weekend. You might want that shirt later on. But what do you have for tomorrow then? If this all sounds ridiculous, it is. If you’re thinking it’s an exaggeration, it is not. I go through this very scenario at least once a week trying to pick out a shirt to wear. For every positive outcome I can think of, I seem to also be able to think of an equally compelling negative argument. Now, eventually, I have to pick a shirt out of the closet, so I’m forced to make a decision of some sort. Even if it winds up being the “wrong” one, I at least have done something to progress things along. Not every situation is like that, however. There are instances where the decision to make a non-decision actually becomes a decision that makes a decision impossible. Depressed people have major problems making decisions. In my case, though, I seem to be just good enough at making decisions to get myself into the middle of situations where no direction appears to be the right one to take. As a result, I adopt this weird sort of holding pattern where I just take it and take it and take it, feeling powerless to really do anything about what’s going on. It’s the classic “rock and a hard place” scenario; either way you go is going to end in some result you won’t really like. Just like the shirt, though, the only way to reach some sort of resolution is to actually make a decision of some sort. This is where the specter of regret enters the equation. What if the decision I make is wrong? What if it actually makes things worse? What if it’s irreversible? Well, the answers to those questions are as follows: It could be, it could be, and it could be. Making the right move is never a guarantee, which drives the perfectionist tendencies of the depressed mind to distraction. What I am having to learn right now through a very painful and trying set of circumstances is that every decision is made with the best resources and experience and knowledge and judgement a person has at that particular moment. In simpler terms, you do the best you can with what you have. With that attitude, even if the decision winds up being wrong, regret can be sort of headed off at the pass. A good friend of mine used to joke and say, “Whatever you did, that’s what you meant to do.” Maybe it wasn’t so much of a joke, though. Maybe learning to live with consequences instead of regretting them is the real key to resolving situations. Hopefully, I’ll remember all this the next time I’ve been standing in front of my closet for 10 minutes trying to decide between the grey or the blue T-shirt. More importantly, though, I hope I remember it the next time I feel as if my back is against the wall. There’s always a choice. Make it a good one.